In 1926, the American Motorcyclist Association introduced a new category of lightweight racing machines with the displacement limited to 350cc, a category that was already popular in Europe. Harley-Davidson, best known for its big V-twins, set to work and produced a remarkable little overhead-valve single that was quickly named "Peashooter" because of the characteristic sound of its exhaust. 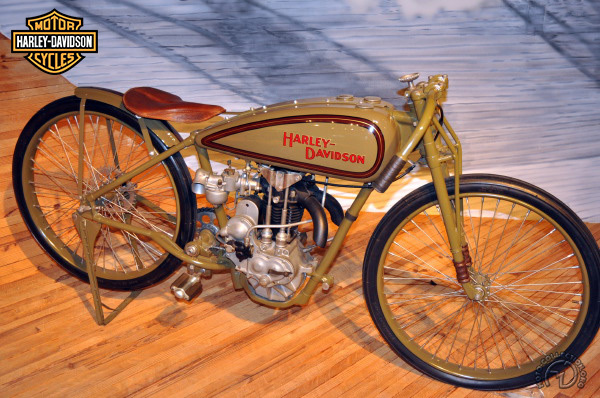 This Harley was advanced for its day, with a hemi-head and inclined valves – the exhaust valve was sodium-cooled, a technique later adopted on many racing engines by makers such as Norton. The final drive chain was on the right, which was an advantage on the US cinder tracks of the 1920s. But the 350 class wasn't a great success in the US. These lightweight Harleys continued their sports career with brilliance in England after the introduction of speedway racing there in 1928 on short dirt-tracks of 250 to 440 yards. For the English tracks, the Peashooter was stripped of every surplus item – such as brakes! – and the cylinder head with twin exhaust pipes fitted to the early versions was replaced by one with a short exhaust stub. Some riders replaced the gearbox with a single-speed transfer box and clutch, while others adopted a two-speed box but only used first gear for starting. But the reign of these Harleys was brief – they were soon surpassed by the Douglas flat-twin and Rudge 500. Converted for the new sport of speedway racing in Great Britain, this Peashooter bas a short single exhaust instead of the earlier twin-port head.